Necklace comprising ten white pierced hollow bio resin ovals strung on pvc cord and secured with a silver clasp. The main material of the piece is bioresin which is an eco plastic that I have pioneered in jewellery since 1999. It was developed by a German chemist to create a more sophisticated and less toxic casting resin. It has greater optical clarity and is biodurable (but not biodegradable) and it’s main ingredient is sunflower seed oils rather than petrochemicals. Between the years 2001-2014 the bioresin was available from an ecological art supplier in London but now needs to be imported from Switzerland. 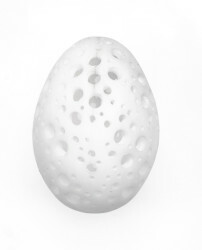 The hollow egg forms are cast in rubber moulds and subsequently pierced by hand. The inside cord is pvc which is finished with a riveted sterling silver fastening. Light Constructions Neckpiece, Sarah King, 2004. Photo: Stokes Photo Ltd. In 2003 I exhibited a new body of work ‘Light Constructions’ for a solo exhibition at Arai Atelier Gallery in Tokyo which provided a pivotal opportunity. I was frustrated by not having control of how my work was displayed and its context and it was also an opportunity to consider a new body of work as a whole. All of the pieces were white or transluscent bioresin and silver and exhibited in such a way to accentuate their shadows. I wanted to explore qualities of light, space, transparency and absence made visible. My sources of inspiration were an interest in objects in series, and abstract art that reduces materials, forms or abstract qualities to their essence. All of the work in this exhibition were bangles or rings with repeated forms to aid direct comparison of their visual differences. This neckpiece was one subsequent series extending these ideas into necklaces using moulds made from eggs: quails, hens, ducks, geese and ostriches. I was interested in their sculptural qualities rather than any symbolic connotations and how they sat together when repeated. Within a neckpiece they make a collar that frames the face and although being quite large, are visually and physically light. The piercing of each piece is a compelling transformation making the interior visible and creating tension between the overall form, its surface and it’s enclosed space.